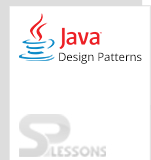 Iterator Pattern is a Behavioral Pattern and is mostly used in Java Collection Framework. Iterator pattern can be used in java and .net environments. Using iterator pattern, one can use aggregate object in sequential manner without exposing the implementation. Iterator Pattern has methods and interfaces that are very important and easy to implement. Polymorphic traversal can be done easily. Decoupling of collection and algorithms can be done. Configuration management can be reduced. Aggregate: Aggregate is used for defining an interface for creating the Iterator object. ConcreteAggregate: ConcreteAggregate is used for implementing the interface and returns an instance of the ConcreteIterator. Iterator: Iterator is used for defining the interface to access and traversal of the elements. 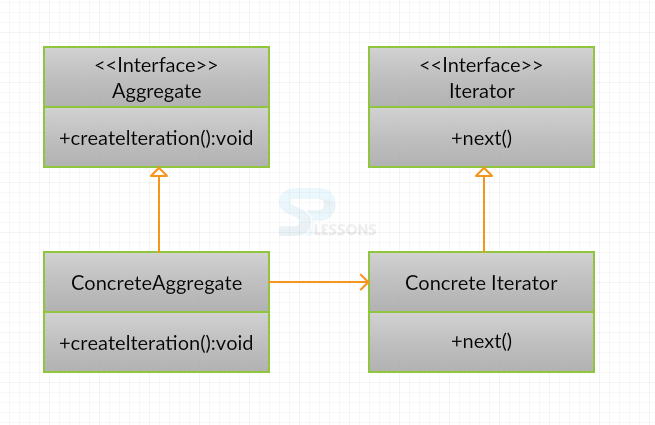 ConcreteIterator: ConcreteIterator is used for implementing the interface while keeping track of the current position of the Aggregate traversal. Creating a class ItemsList and importing a package(java util.*;). Iterator Pattern can be used along with visitor and composite pattern. Iterator can be hidden because the implementation is done through collections. The logic for iteration can be embedded in collections.